2001-10-15 Assigned to NINTENDO CO., LTD. reassignment NINTENDO CO., LTD. ASSIGNMENT OF ASSIGNORS INTEREST (SEE DOCUMENT FOR DETAILS). Assignors: LEATHER, MARK M., LAW, PATRICK Y., DREBIN, ROBERT A., KOMSTHOEFT, MATTHEW, VAN HOOK, TIMOTHY J. A hardware-accelerated recirculating programmable texture blender/shader arrangement circulates computed color and alpha data over multiple texture blending/shading cycles (stages) to provide multi-texturing and other effects. Up to sixteen independently programmable consecutive stages, forming a chain of blending operations, are supported for applying multiple textures to a single object in a single rendering pass. This application claims the benefit of U.S. Provisional Application serial No. 60/226,888, filed Aug. 23, 2000, the entire content of which is hereby incorporated by reference in this application. This application is related to concurrently-filed application Ser. No. 09/726,212 of Law et al entitled “Method And Apparatus For Providing Logical Combination Of N Alpha Operations Within A Graphics System”. The present invention relates to computer graphics, and more particularly to interactive graphics systems such as home video game platforms. Still more particularly this invention relates to recirculating shader hardware for implementing shade trees for multitexturing and other effects. A problem graphics system designers confronted in the past was how to efficiently implement shaders in a graphics system. Generally, shading is the process performing lighting computations and determining pixel colors/opacities from them. Generally, there are three main types of shading in common use: flat, Gouraud, and Phong. These correspond to computing the light per polygon, per vertex and per pixel. A wide variety of shading models have been created. There is no one shading model that pleases all users and is suitable for all applications. Therefore, several design approaches have been suggested to provide flexibility in terms of programmer selection and specification of shading models. In the paper by R. L. Cook called “Shade Trees” (SIGGRAPH 84, pages 223-231, the author described a special purpose language in which a shader is built as a tree expression called a shade tree. Generally speaking, a shade tree is a tree of nodes each of which takes parameters from its children and produces parameters for its parent. For example, the parameters may be the terms of the illumination equation (e.g., specular coefficient or surface Normal). Other parameters might comprise atmospheric effects (e.g., haze) or projections. The RenderMan Interface uses shade trees to provide user-defined and system-defined shaders for a variety of purposes. While shade trees have been used extensively in non-real-time rendering graphics systems, problems arise when trying to accommodate the flexibility that shade trees provide within the context of real-time rendering. It would be highly desirable to be able to provide the flexibility of shade trees within low cost real-time rendering systems such as, for example, home video game platforms and personal computer graphics cards. Another problem confronting graphics systems designers has been how to efficiently provide a feature called single-pass multitexturing. Basically, texturing is a technique for efficiently modeling the properties of a surface. For example, instead of modeling the geometry of each individual brick and mortar line within a brick wall, it is possible to electronically “glue” an image of a brick wall onto a surface. Such texturing capabilities can be used to significantly increase image complexity without a corresponding increase in modeling and processing costs. The extension to texturing known as multitexturing allows two or more textures to be applied to the same surface. For example, suppose you want to create an image of the earth as it might be seen from outer space. You could model the earth as a sphere and apply two different textures to it. The first texture could be an image of the continents and oceans. The second texture could be an image of cloud cover. By moving the cloud cover texture image relative to the continent/ocean texture image, you could create a very realistic dynamic texture-mapped image. Some graphics accelerators support multitexturing in which two or more textures are accessed during the same rendering pass. See, for example, Microsoft's Direct X 6.0 SBK (1998); Segal et al., “The Open GL Graphics System: A Specification” (Version 1.2.1) (March 1998) (www.OpenGL.org). Certain PC graphics accelerator cards also provide single pass multitexturing. However, further improvements are possible. The present invention provides a generalized shade tree blender that can be used for multitexturing as well as a number of other flexible blending effects. In accordance with one aspect provided by this invention, recirculating shader hardware within a graphics pipeline can be controlled to provide a number of independently controllable blending stages. A shader hardware includes intermediate storage for results of previous blending operations. The shader hardware can select different inputs and perform different operations for each blending stage. Thus, relatively low cost and compact shader hardware can be used to implement arbitrarily complex shade trees. In accordance with another aspect provided by this invention, the results of a first texture mapping operation is provided to a reconfigurable shader. The shader performs a blending operation in response to the first texture mapping operation. The shader is then reconfigured, and is connected to receive the results of a further texturing operation. The reconfigured shader combines its previous results with the results of the further texturing operation to provide a blended output. In accordance with a further aspect provided by this invention, a shader can be recirculated any desired number of times to implement an arbitrarily complex shading model. Each recirculation or “stage” can be programmed to have any one of a number of desired blending operations and to blend from selected ones of a variety of color, opacity or depth sources. The number of recirculations may be limited in a particular implementation in view of real-time rendering timing constraints, but a reasonable number of recirculation stages (e.g., fifteen) can provide great flexibility in implementing a variety of complex shading models. In accordance with another aspect provided by this invention, a recirculating shade tree pixel blender is implemented in hardware to minimize processing time per stage. In more detail, a preferred embodiment of this invention provides a relatively low chip-footprint, versatile texture-environment processing subsystem including a hardware accelerated programmable texture shader/pixel blender that circulates computed color, opacity and other data over multiple cycles/stages. The texture environment subsystem can combine per-vertex lighting, textures, rasterized colors, opacities, and depths to form pixel parameters for display. Blending operations for color (e.g., RGB) and alpha components may be independently processed within the texture environment subsystem by a blending unit comprising a set of color/alpha combiner (shader) hardware that is reused over multiple processing stages to implement multitexturing and other effects. Selectable current-color/opacity input/output registers may be shared among all stages to store intermediate results. The shader hardware can be reconfigured for each stage to provide a chain of specifiable blending/shading operations supporting single rendering pass multitexturing and other effects. FIGS. 20A and 20B show example alternative compatible implementations. In this example, system 50 is capable of processing, interactively in real-time, a digital representation or model of a three-dimensional world. System 50 can display some or all of the world from any arbitrary viewpoint. For example, system 50 can interactively change the viewpoint in response to real-time inputs from handheld controllers 52 a, 52 b or other input devices. This allows the game player to see the world through the eyes of someone within or outside of the world. System 50 can be used for applications that do not require real-time 3D interactive display (e.g., 2D display generation and/or non-interactive display), but the capability of displaying quality 3D images very quickly can be used to create very realistic and exciting game play or other graphical interactions. Example system 50 includes a video encoder 120 that receives image signals from graphics and audio processor 114 and converts the image signals into analog and/or digital video signals suitable for display on a standard display device such as a computer monitor or home color television set 56. System 50 also includes an audio codec (compressor/decompressor) 122 that compresses and decompresses digitized audio signals and may also convert between digital and analog audio signaling formats as needed. Audio codec 122 can receive audio inputs via a buffer 124 and provide them to graphics and audio processor 114 for processing (e.g., mixing with other audio signals the processor generates and/or receives via a streaming audio output of mass storage access device 106). Graphics and audio processor 114 in this example can store audio related information in an audio memory 126 that is available for audio tasks. Graphics and audio processor 114 provides the resulting audio output signals to audio codec 122 for decompression and conversion to analog signals (e.g., via buffer amplifiers 128L, 128R) so they can be reproduced by loudspeakers 61L, 61R. FIG. 4 shows a more detailed view of an example 3D graphics processor 154. 3D graphics processor 154 includes, among other things, a command processor 200 and a 3D graphics pipeline 180. Main processor 110 communicates streams of data (e.g., graphics command streams and display lists) to command processor 200. Main processor 110 has a two-level cache 115 to minimize memory latency, and also has a write-gathering buffer 111 for uncached data streams targeted for the graphics and audio processor 114. The write-gathering buffer 111 collects partial cache lines into full cache lines and sends the data out to the graphics and audio processor 114 one cache line at a time for maximum bus usage. Command processor 200 receives display commands from main processor 110 and parses them—obtaining any additional data necessary to process them from shared memory 112. The command processor 200 provides a stream of vertex commands to graphics pipeline 180 for 2D and/or 3D processing and rendering. Graphics pipeline 180 generates images based on these commands. The resulting image information may be transferred to main memory 112 for access by display controller/video interface unit 164—which displays the frame buffer output of pipeline 180 on display 56. For details concerning the operation of blocks 500 a,500 b and 500 c, a more detailed description of the example graphics pipeline circuitry and procedures for performing regular and indirect texture look-up operations is disclosed in commonly assigned co-pending patent application, Ser. No. 09/722,382, entitled “Method And Apparatus For Direct And Indirect Texture Processing In A Graphics System” and its corresponding provisional application, Ser. No. 60/226,891, filed Aug. 23, 2000, both of which are incorporated herein by this reference. As shown in FIG. 5, texture environment unit 600 a in the example embodiment includes a recirculating shader 602. Recirculating shader 602 in this example comprises a hardware-based general purpose blender that can blend between a number of selected inputs and can retain blended results for further blending in a subsequent blending operation. Recirculating shader 602 in this example comprises reusable blending logic that can implement a number of different blending operations. In the example embodiment, recirculating shader 602 can retain a number of different distinct previous blending results and can blend newly provided values with any of these previously blended results. This allows recirculating shader 602 to implement any arbitrary shade tree through successive recirculated stages. See, for example, Cook, Shade Trees, SIGGRAPH Proceedings, pages 223-231 (July 1984). The complexity of the shade tree that recirculating shader 602 can implement is limited by the total number of times recirculating shader 602 can recirculate within a given rendering pass. In the example embodiment, recirculating shader 602 can provide up to fifteen recirculated stages in the example embodiment but different implementations could provide different numbers of recirculating stages. Once texture environment unit 600 generates a blended color/alpha/z output, pixel engine 700 performs depth (z) compare (700 a) and frame buffer pixel blending (700 b). In this example, pixel engine 700 stores data into an embedded (on-chip) frame buffer memory 702. Graphics pipeline 180 may include one or more embedded DRAM memories 702 to store frame buffer and/or texture information locally. Z compares 700 a′ can also be performed at an earlier stage in the graphics pipeline 180 depending on the rendering mode currently in effect (e.g., z compares can be performed earlier if alpha blending is not required). The pixel engine 700 includes a copy operation 700 c that periodically writes on-chip frame buffer 702 to main memory 112 for access by display/video interface unit 164. This copy operation 700 c can also be used to copy embedded frame buffer 702 contents to textures in the main memory 112 for dynamic texture synthesis effects. Anti-aliasing and other filtering can be performed during the copy-out operation. The frame buffer output of graphics pipeline 180 (which is ultimately stored in main memory 112) is read each frame by display/video interface unit 164. Display controller/video interface 164 provides digital RGB pixel values for display on display 102. FIG. 6 shows a high-level block diagram of an example recirculating shader implementation, and FIG. 7 shows a logical diagram of an example shader pipeline that can be implemented using the FIG. 6 recirculating shader. As shown in FIG. 6, recirculating shader 602 receives a number of different inputs and generates an output that can be fed back to its input. In the example embodiment, the rasterized color/alpha may be provided by rasterizer 400. For example, the rasterized color/alpha can be Gouraud shaded pixels determined by rasterizer 400 based on lighting calculations performed by transform unit 300 on a per-vertex basis. Texture color/alpha may be the result of a direct or indirect texture mapping operation performed by texture unit 500. Recirculating shader 602 blends any/all of these values and/or constants based on a programmable blending operation to provide a computed color/alpha value at its output. This computed color/alpha value can be fed back as an input to recirculating shader 602 for use in a subsequent blending operation. FIG. 7, shows an example recirculating shading pipeline that can be provided by recirculating shader 602. This logical pipeline provides multiple sequential blending stages each of which can blend a computed color/alpha with a texture color/alpha and/or a rasterized color/alpha. In the example embodiment, up to sixteen different stages of blending operations can be provided with each stage receiving interpolated texture and raster color/alpha. Programming of rasterizer 400 (see FIG. 5) specifies which one of eight texture coordinate sets and which one of eight physical textures 504 to use for texture interpolation provided by recirculating shader 602. Rasterizer 400 may also control which one of two rasterized colors is used for a given recirculating shader 602 stage. FIG. 8 shows a block diagram of an example implementation of recirculating shader 602 suitable for use in texture environment block 600. In the example shown, recirculating shader 602 includes a number of input multiplexers 656 for selecting among various different inputs (e.g., texture color/alpha, rasterized color/alpha, and results of prior blending operations) to be operated on by a blending operator 658. The results of blending operator 658 can be stored in any one of four intermediate registers 660 in the example embodiment. Any one of these registers 660 may then be selected by input multiplexers 656 for a further blending operation in a subsequent blending stage. In the example embodiment, recirculating shader 8 provides a color component operation and a separate alpha component operation for each blending stage. For a given stage, the operation performed by block 658 can be different for the color component and the alpha component. The color and alpha component operations can be independently controlled by the application running on main microprocessor 110. This ability to provide independent color and alpha operation controls for each recirculating stage allows recirculating shader 602 to perform arbitrarily complex alpha (transparency) trees of operations at no additional cost in terms of processing speed. The alpha produced by the last stage of recirculating shader 602 is input to alpha compare block 662. The results of this alpha compare operation 662 can be used to, for example, conditionally mask color and/or z writes to embedded frame buffer 702. In the example embodiment, the final blended output of the last blending stage is stored in register 660(4) for color output and/or alpha thresholding 662. A z-texturing path is also provided for z-texturing. See copending commonly assigned U.S. patent application Ser. No. 09/722,378 of Leather et al. entitled “Z-Texturing” and its corresponding Provisional Application No. 60/226,913, filed Aug. 23, 2000, both of which are incorporated herein by reference. Input controls to multiplexers 656 can be specified independently for each r recirculating shader stage. Multiplexer 656 outputs in example embodiment are unsigned 8-bit values or signed 10-bit values but other implementations could provide different precisions. Calculation block 664 operates on values A, B and C in the example embodiment. The output of calculation block 664 is passed through an optional negate block 666 and is added by adder 668 with the output of “D” multiplexer 656(D) and an optional bias value. The resulting sum can be scaled by a scaler block 670 and clamped by a clamp block 672 before being stored in any one of registers 660(1), 660(2), 660(3), 660(4) for output and/or subsequent further blending. In the example embodiment, scale block 670 can scale by 0.5, 1, 2 or 4—but other implementations would provide other scaling factors. Clamping block 672 can support a number of different clamping modes. In one implementation, incoming values A, B, C may be unsigned 8-bit values in one implementation, incoming value D can be a signed 10-bit value, and the output of clamp block 672 can be a signed 10-bit value. FIG. 11 shows a more detailed implementation of recirculating shader 602. In this example, calculation block 664 is implemented by hardware multipliers 664 b, 664 c; a “1−f” complementing block 664 a; and an adder 664 d. In this example, the multiplier 664 b multiplies the B and C inputs and provides the resulting product to one input of adder 664 d. The other multiplier 664 c multiplies the A input by the value (1−C) and provides its resulting product to the other input of adder 664 d. This hardware computes the equation shown in FIG. 10 as being computed by block 664. The resulting product provided by an adder 664 is outputted to the sign reversal block 666. In the embodiment shown in FIG. 11, an additional comparator 674 is provided to compare multiplexer 656 outputs A and D, with the results of the comparison being used to select between multiplexer 656 output C and a zero value (via multiplexer 676). An additional multiplexer 678 is provided in the data path to select between the output of sign operator 666 and the output of multiplexer 676 (i.e., the result of the comparison operation). Such comparisons can save recirculation stages by performing a blending calculation and a compare result operation all in one recirculation stage. This comparator 674 in the example embodiment can compare one, two or three channels simultaneously to provide 8-bit, 16-bit or 24-bit compares. In the example embodiment, different scaling blocks 670 a, 670 b, 670 c, 670 d are selected by a multiplexer 670 e for providing to clamp block 672. In the example embodiment shown in FIG. 11, inputs to multiplexer 656 may optionally be passed through “color swap” blocks 680 before calculation by block 664. Color swap block 680 can be used to broadcast each color component (R, G, or B) to the other two color components. See FIGS. 12A, 12B. This feature can be used for dot product, intensity calculation and color space conversion, for example. The example embodiment shown in FIG. 11 includes support for static and programmable constants. In one embodiment, a constant select is used to select an arbitrary constant value determined by constant select registers specifying whether to use one of plural statically defined values or one of plural programmable color register values. Such programmable and fixed constants provide flexibility in the blending operation. In other embodiments, a smaller number of fixed constants (e.g., 1.0) could be used instead. The second argument is modulated with the first's alpha and the result is added to the first argument. This example is for detail texturing. The difference textures have a bias of 0.5. The alpha functionality of recirculating shader 602 (e.g., in combination with the non-recirculating alpha compare) can be used to provide a transparency tree analogous to a shade tree. In particular, recirculating shader 602's alpha functionality can be used to provide N logical alpha operations on M alpha inputs, where N and M can be any integers. The combination of alpha compares and alpha logical operations can be used, for example, to provide non-photorealistic effects such as cartoon outlining. See, for example, commonly assigned copending U.S. patent application Ser. No. 09/726,212 of Law et al. entitled “Method and Apparatus For Providing Non-Photorealistic Cartoon Outlining Within A Graphics System” and its corresponding provisional application, serial No. 60/226,915, filed Aug. 23, 2000, both of which are incorporated herein by this reference. Shader 602 supports sprites with depth by modifying the screen z value using texture mapping. Once enabled, shader 602 sends four z values to pixel engine 700 per quad instead of a reference z and two slopes. Each z value is obtained by adding a z texel to the quad reference z or replacing the reference z with the z texel. See the commonly-assigned z texturing patent application referenced above. FIG. 13 shows an example block diagram of texture environment unit 600 including shader 602. Texture environment unit 600 in the example embodiment includes a fog operator 690 and a fog blender operator 692 in addition to a command section 694 and shader 602. For details concerning the operation of blocks 690, 692, see copending commonly assigned U.S. patent application Ser. No. 09/726,225 of Law et al. entitled “Method And Apparatus For Providing Improved Fog Effects In A Graphics System” and its corresponding provisional application, serial No. 60/227,032, filed Aug. 23, 2000, both of which are incorporated herein by this reference. FIG. 14 shows a more detailed block diagram of the fog operations. FIG. 15 shows how a recirculating shader 602 can be used for multitexturing. In the example embodiment, recirculating texture unit 500 is capable of presenting a sequence of texture mapping outputs corresponding to a given surface. For example, it is possible in one implementation to map up to eight different textures onto the same primitive surface. Recirculating texture unit 500 can provide direct (and indirect) texturing operations generating a corresponding sequence of texture mapping outputs. In the example embodiment, recirculating shader 602 receives each mapped texture output as it becomes available and blends the mapped texture output with primitive surface color/alpha information derived from the lighting operations performed by transform unit 300 and/or with other, previously generated texture mappings. Recirculating shader 602 performs its blending operations in a pipelined manner so that the recirculating shader blends a texture output previously generated by texture unit 500 while the texture unit is generating a further texture output in the sequence. In the example embodiment, recirculating shader 602 retains intermediate blending results for further blending with additional information provided by recirculating texture unit 500. Soon after recirculating texture unit 500 develops a final texture mapping output in a sequence of texture mapping outputs, recirculating shader 602 can perform a corresponding final blend operation and output the blending results via fog block 600 b for depth buffering, final color blending with frame buffer 702 contents, and display. FIG. 16 shows an example multitexturing process using recirculating shader 602 shown in FIG. 6. In the illustrative non-limiting example of FIG. 16, transform unit 300 generates texture coordinate data (block 1002). System 50 then associates the generated texture coordinate data with a particular texture map, and texture unit 500 retrieves the corresponding texels (texture data) from the texture map (block 1004). Meanwhile, recirculating shader 602 is configured to perform a predetermined blending/shading operation, and the retrieved texture data is provided to the recirculating shader 602 for blending (block 1008). Recirculating shader 602 can blend the retrieved texture data with some other input and/or a retained prior result (block 1010). For example, recirculating shader 602 might blend a retrieved texture data with a color or opacity value generated by lighting block 300 e corresponding to a Gouraud shading operation performed on a polygon on a per-vertex basis. Blending operation 1010 might in some cases operate to blend retrieved texture data with previously retrieved texture data. Sometimes blend operation 1010 may perform a transformation on the retrieved texture data, or may simply act to pass through the retrieved texture data for storage within recirculating shader 602 for a subsequent blending operation. Recirculating shader 602 temporarily stores the output of blend operation 1010 as an intermediate result (block 1012). The entire process may then be recirculated any number of times to retrieve and blend additional sets of texture data. In the example embodiment, recirculating shader 602 can perform blocks 1010, 1012 at the same time that texture unit 500 performs blocks 1004, 1008 to retrieve an additional texture mapping. FIG. 17 shows an example multi-texture pipeline using recirculating shader 602. FIG. 17 illustrates that each time recirculating shader 602 recirculates, it provides an additional, independently controlled blending stage capable of blending a new data set with any or all of the blend results provided by previous blending operations. Because example preferred embodiment system 50 is a real-time rendering system, the number of times that recirculating texture unit 500 can recirculate is limited by the amount of time it takes for each recirculation relative to the time between image frames (e.g., 1/30 or 1/60 of a second). In one example embodiment, the total number of recirculations that recirculating texture unit 500 can perform in a single rendering pass might be eight, although different implementations might provide different numbers of recirculations. In the example embodiment, recirculating shader 602 can recirculate approximately twice as many times as texture unit 500 can recirculate. The additional recirculations provided by recirculating shader 602 can be used to perform a number of enhanced and interesting image effects including, for example, fog, z texturing, environment mapping, embossing, detailed texturing, and other imaging effects. The texture input to recirculating shader 602 are preferably set to null during stages where texture unit 500 cannot make a texture available. FIG. 18 shows an example control step for controlling recirculating shader 602 to provide a multi-texturing operation. In this particular example, main processor 110 may specify a number of different vertices 214 to be lit and/or transformed by transform unit 300. Transform unit 300 may generate appropriate texture coordinates for application to texture unit 500, while rasterizer 400 may rasterize the vertices based on lighting calculations. The texture coordinates so generated can be used in a series of texture mapping operations based on a number of texture maps 504. These texture mapping results may be provided sequentially to a number of sequential recirculating shader 602 stages to provide multitexture blending. gen_mode ntev 4 Specifies the current texture stage count (1-16). tev_color_env_i dest 2 Specifies the destination register. 1 TEV_SHIFT_1 Shift left by 1. 2 TEV_SHIFT_2 Shift left by 2. 3 TEV_SHIFT_R Shift right by 1. 0 TEV_SHIFT_R8 Compare red channels only. clamp 1 Specifies the clamping operation (see Section 9). bias 2 Specifies the value of bias. sub 1 Specifies add or subtract of the blend result. 0 TEV_SUB_ADD Add blend result. 1 TEV_CLAMP_SUB Subtract blend result. 0 TEV_ASEL_A_CA0 Register 0 alpha. 1 TEV_ASEL_A_CA1 Register 1 alpha. 2 TEV_ASEL_A_CA2 Register 2 alpha. 3 TEV_ASEL_A_CA3 Register 3 alpha. selb 3 Specifies argument B. selb is similar to sela. selc 3 Specifies argument C. selc is similar to sela. seld 3 Specifies argument D. seld is similar to sela. tsel, 2 Specifies the texture color swapping mode. sela 4 Specifies argument A. 0 TEV_CSEL_CC0 Register 0 color. 1 TEV_CSEL_CA0 Register 0 alpha. 2 TEV_CSEL_CC1 Register 1 color. 3 TEV_CSEL_CA1 Register 1 alpha. 4 TEV_CSEL_CC2 Register 2 color. 5 TEV_CSEL_CA2 Register 2 alpha. 6 TEV_CSEL_CC3 Register 3 color. 7 TEV_CSEL_CA3 Register 3 alpha. selc 4 Specifies argument C. selc is similar to sela. seld 4 Specifies argument D. seld is similar to sela. tev_alpha_env_i dest 2 Specifies the destination register. shift 2 Specifies the amount to shift. mode 2 Specifies the clamping mode (see Section 9). Rev. A. only! 1 TEV_MODE_GE0 Greater than ore equal to 0. 2 TEV_MODE_EQ0 Equal to 0. 3 TEV_MODE_LE0 Less than or equal to 0.
tsel, 2 Specifies the texture and raster color swapping mode. tev_registerl_i r, a s2.8 Specifies the value of the texture current color. tev_registerh_i g, b s2.8 Specifies the value of the texture current color. tev_range_adj_c center 10 Specifies the screen's x center for range adjustment. 0 TEV_ENB_DISABLE Disable range adjustment. 1 TEV_ENB_ENABLE Enable range adjustment. rev_range_adj_k r2k, u4.8 Specifies the range adjustment function. value of “b” parameter's exponent +1. tev_fog_color r, g, b 8 Specifies the value of fog color. op1 3 Specifies alpha operation 1. Similar to op0. a0 8 Reference alpha 0.
a1 8 Reference alpha 1.
tev_env_z_0 zoff u24.0 Specifies the z bias used in a z texture. 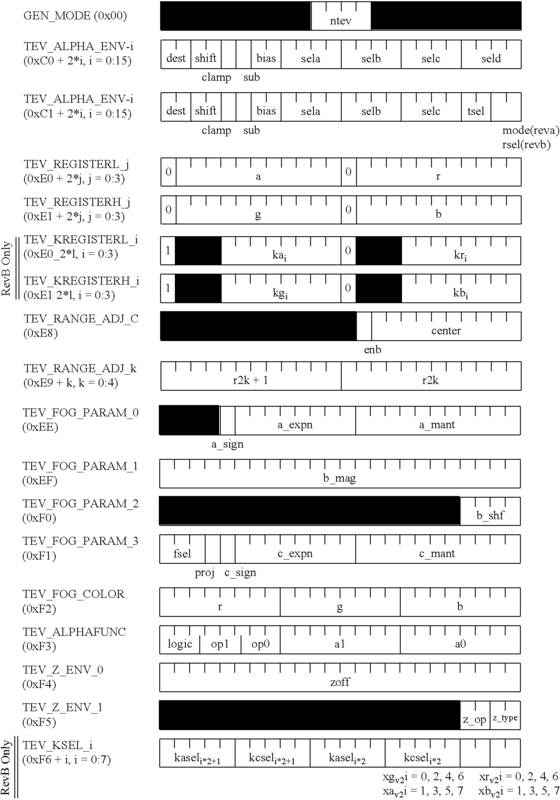 tev_env_z_1 type 2 Specifies the z texel type. op 2 Enables z texturing. (RevB) kasel only applies to rev B. Description: This is a convenience function designed to make initial programming of the Texture Environment unit easier. This macro calls GXSetTevColorIn, GXSetTevColorOp, GXSetTevAlphaIn, and GXSetTevAlphaOp with predefined arguments to implement familiar texture combining functions. To enable a consecutive set of recirculating shader stages, the application should call the GXSetNumTevStages function. In the table below, Cv is the output color for the stage, Cr is the output color of previous stage, and Ct is the texture color. Av is the output alpha for a stage, Ar is the output alpha of previous stage, and At is the texture alpha. As a special case, rasterized color (GX_CC_RASC) is used as Cr and rasterized alpha (GX_CA_RASA) is used as Ar at the first recirculating shader stage because there is no previous stage. Arguments: id=stage id, mode=predefined color combining modes. Texture Environment (Recirculating shader) stage name. Description: sets Texture Environment control. This function enables a consecutive number of Texture Environment (recirculating shader) stages. The output pixel color (before fogging and blending) is the result from the last stage. The last recirculating shader stage must write to register GX_TEVPREV, see GXSetTevColorOp and GXSetTevAlphaOp. At least one recirculating shader stage should be enabled. If a Z-texture is enabled, the Z texture is looked up on the last stage, see GXSetZTexture. The association of lighting colors, texture coordinates, and texture maps with a recirculating shader stage is set using GXSetTevOrder. The number of texture coordinates available is set using GXSetNumTexGens. The number of color channels available is set using GXSetNumChans. GXInit will set nStages to 1 as a default. This function sets the input operands of the Texture Environment (recirculating shader) color combiner unit. The input operands a, b, and c are RGB colors where each component is unsigned 8-bit (0<=a,b,c<=255). The d input operand is an RGB color where each component is a signed 10-bit input (−1024<=d<=1023). In the cases where the input operand is an alpha value (GX_CC_A0, GX_CC_A1, GX_CC_A2, GX_CC_APREV, GX_CC_TEXA, GX_CC_RASA), the alpha value is replicated across the three color channels (R=A, G=A, B=A). The function implemented by this recirculating shader stage is set using the function GXSetTevColorOp. The output of this stage is directed by default to register GX_TEVPREV (see GXInit), but may be set explicitly by GXSetTevColorOp. The registers used to store the output of Recirculating shader stages can also be used as inputs, GX_CC_C0, GX_CC_C1, GX_CC_C2, GX_CC_CPREV. You can program these registers with constant color values using GXSetTevColor or GXSetTevColorS10. Each register can store either an unsigned 8-bit number or a signed 10-bit number per component (RGB). If a signed 10-bit number is selected for inputs a, b, or c, the number is truncated to 8 bits. No attempt is made to convert the number, the most significant bits are simply discarded. The input operands GX_CC_RASC and GX_CC_RASA are the result of the per-vertex lighting equations. The input operands GX_CC_TEXC and GX_CC_TEXA are the texture inputs for this stage. The texture color input GX_CC_TEXC, may have its color components swapped before input by setting operands GX_TC_TEXRRR, GX—TC_TEXGGG or GX_TC_TEXBBB. You can select one of the swap operands per Recirculating shader stage. In an example embodiment, it is illegal to use both GX_TC_TEXRRR and GX_TC_GGG in the same stage. GXSetTevOrder associates a shader stage with particular colors and textures. stage Name of the Recirculating shader stage. a Input color operand, unsigned 8b per component. b Input color operand, unsigned 8b per component. c Input color operand, unsigned 8b per component. d Input color operand, signed 10b per component. This function sets the input operands for one stage of the Texture Environment (recirculating shader) alpha combiner unit. The input operands a, b, and c are unsigned 8-bit inputs (0<=a,b,c<=255). The d input operand is a signed 10-bit input (−1024<=d<=1023). The operations described by op, bias, and scale are programmable using the GXSetTevAlphaOp function. GXSetTevClampMode. When the input a, b, or c is from a signed 10-bit number (either the results of a previous recirculating shader stage or an input constant) only the 8 least-significant bits are used. There is no attempt to convert the number, the upper bits are simply discarded. The registers used to store the output of Recirculating shader stages can also be used as inputs, GX_CA_A0, GX_CA_A1, GX_CA_A2, GX_CA_APREV. You can program these registers with constant alpha values using GXSetTevColor or GXSetTevColorS10. The input operand GX_CA_RASA is the result of the per-vertex lighting equations. The input operand GX_CA_TEXA is the texture alpha input for this stage. You can select the colors and textures to which these inputs correspond using GXSetTevOrder. stage The name of the stage. The input parameters a, b, c, and d are selected using the GXSetTevColorIn function. The a, b, and c inputs are unsigned 8 b inputs (0<=a,b,c<=255). The d input is a signed 10 b input (−1024<=d<=1023). The result, out_reg, can also be a signed 10 b result, depending on the clamp enable and the current clamping mode, see GXSetTevClampMode. The recirculating shader output registers are shared among all the recirculating shader stages. The recirculating shader output registers can also be used as constant color inputs, so the application should be careful to allocate input and output registers so no collision occurs when implementing a particular equation. The application must output to GX_TEVPREV in the last active recirculating shader stage. The function GXSetTevOp provides a simpler way to set the parameters of GXSetTevColorIn and GXSetTevColorOp based on predefined equation names. You should not mix usage of GXSetTevOp and GXSetTevColorIn/GXSetTevColorOp. GXSetTevOp makes some assumptions about the output register usage, namely that GX_TEVPREV is always the output register and is used to pass the result of the previous recirculating shader stage to the next recirculating shader stage. stage Recirculating shader stage name. The input parameters a, b, c, and d are set using GXSetTevAlphaIn. The a, b, and c inputs are unsigned 8 b inputs (0<=a,b,c<=255). The d input is a signed 10 b input (−1024<=d<=1023). The result, out_reg, can also be a signed 10 b result, depending on the clamp enable and the current clamping mode, see GXSetTevClampMode. You must enable a consecutive number of recirculating shader stages using GXSetTevStages. The last active recirculating shader stage writes its output to register GX_TEVPREV. clamp Clamp results when GX_TRUE. This function is used to set one of the constant color registers in the Texture Environment (recirculating shader) unit. These registers are available to all recirculating shader stages. At least one of these registers is used to pass the output of one recirculating shader stage to the next in a multi-texture configuration. The application is responsible for allocating these registers so that no collisions in usage occur. This function can set unsigned 8-bit colors. To set signed, 10-bit colors use GXSetTexColorS10. This function enables the color components to be signed 10-bit numbers. To set 8-bit unsigned colors (the common case) use GXSetTevColor. color=Constant color value. Each color component can have the range −1024 to +1023. This function sets the clamp mode for this stage in the Texture Environment (recirculating shader) unit. This mode is used for both alpha and color combiners. The mode effects how the clamp controls set by GXSetTevColorOp and GXSetTevAlphaOp are interpreted as shown in the table below. R is the TEV stage result color. GXInit sets mode to GX_TC_LINEAR. stage = Tev stage ID. mode = Clamp mode (Accepted values are GX_TC_LINEAR, GX_TC_GE, GX_TC_LE, GX_TC_EQ). This function sets the parameters for the alpha compare function which uses the alpha output from the last active Texture Environment (recirculating shader) stage. The number of active recirculating shader stages are specified using GXSetTevStages. The output alpha can be used in the blending equation (see GXSetBlendMode) to control how source and destination (frame buffer) pixels are combined. The Z compare can occur either before or after texturing, see GXSetZCompLoc. in the case where Z compare occurs before texturing, the Z is written based only on the Z test. The color is written if both the Z test and alpha test pass. When Z compare occurs after texturing, the color and Z are written if both the Z test and alpha test pass. When using texture to make cutout shapes (like billboard trees) that need to be correctly Z buffered, you should configure the pipeline to Z buffer after texturing. ref0=Reference value for subfunction 0, 8-bit. op=Operation for combining subfunction0 and subfunction1. Accepted values are: GX_AOP_AND, GX_AOP_OR, GX_AOP XOR, GX_AOP_XNOR. ref1=Reference value for subfunction 1, 8-bit. This function specifies the texture and rasterized color that will be available as inputs to this Texture Environment (recirculating shader) stage. The texture coordinate coord is generated from input attributes using the GXSetTexCoordGen function, and is used to look up the texture map, previously loaded by GXLoadTexObj. The color to rasterize for this stage is also specified. The color is the result of per-vertex lighting which is controlled by the GXSetChanCtrl function. Note that this function does not enable the recirculating shader stage. To enable a consecutive number of Recirculating shader stages, starting at stage GX_TEVSTAGE0, use the GXSetNumTevStages function. The operation of each recirculating shader stage is independent. The color operations are controlled by GXSetTevColorIn and GXSetTevColorOp. The alpha operations are controlled by GXSetTevAlphaIn and GXSetTevAlphaOp. The number of texture coordinates available for all the active recirculating shader stages is set using GXSetNumTexGens. The number of color channels available for all the active recirculating shader stages is set using GXSetNumChans. Active recirculating shader stages should not reference more texture coordinates or colors than are being generated. This will scale GX_TEXCOOR0 using GX_TEXMAP3 but disable the lookup of GX_TEXMAP3. GXInit describes the default recirculating shader order. color=Color channel. Accepted values are: GX_COLOR0A0, GX_COLOR1A1 and GX_COLOR_NULL. This page shows some samples of the Texture Environment (TEV) settings. This configuration passes rasterized color channel directly by using PASSCLR operation. No texture is used. // The channel COLOR0A0 is supposed to have lit color. This configuration is used for displaying the texture color directly. No rasterized color can be used. // A texture should be loaded to GX_TEXMAP0. // An appropriate texcoord generation should be set to GX_TEXCOORD0. This configuration uses the MODULATE operation. This configuration uses the DECAL operation. The texture should contain alpha value which will be used for blending. // The channel COLOR0A0 is supporsed to have lit color. This configuration uses neither the output from lighting unit or any texture. No texture is used. The first stage passes the first rasterized color by using PASSCLR operation. The second stage adds two colors where a detailed setting is required. // Two Color channels COLOR0/COLOR1 will be used. // Stage0 simply passes the rasterized color. // Stage1 adds the second color and output from previous stage. If the specular color is allowed to be white only, you may use alpha channel for specular lit color which will be broadcasted to each RGB component on a TEV stage. Since it requires only one stage, we can obtain better fill-rate than using two channels. This method can be used if the alpha is not reserved for another purpose. // Color0/Alpha0 may be processed independently. FIG. 20A illustrates an example overall emulation process using a host platform 1201, an emulator component 1303, and a game software executable binary image provided on a storage medium 62. Host 1201 may be a general or special purpose digital computing device such as, for example, a personal computer, a video game console, or any other platform with sufficient computing power. Emulator 1303 may be software and/or hardware that runs on host platform 1201, and provides a real-time conversion of commands, data and other information from storage medium 62 into a form that can be processed by host 1201. For example, emulator 1303 fetches “source” binary-image program instructions intended for execution by system 50 from storage medium 62 and converts these program instructions to a target format that can be executed or otherwise processed by host 1201. As one example, in the case where the software is written for execution on a platform using an IBM PowerPC or other specific processor and the host 1201 is a personal computer using a different (e.g., Intel) processor, emulator 1303 fetches one or a sequence of binary-image program instructions from storage medium 62 and converts these program instructions to one or more equivalent Intel binary-image program instructions. The emulator 1303 also fetches and/or generates graphics commands and audio commands intended for processing by the graphics and audio processor 114, and converts these commands into a format or formats that can be processed by hardware and/or software graphics and audio processing resources available on host 1201. As one example, emulator 1303 may convert these commands into commands that can be processed by specific graphics and/or or sound hardware of the host 1201 (e.g., using standard DirectX, OpenGL and/or sound APIs). FIG. 20B illustrates an emulation host system 1201 suitable for use with emulator 1303. System 1201 includes a processing unit 1203 and a system memory 1205. A system bus 1207 couples various system components including system memory 1205 to processing unit 1203. System bus 1207 may be any of several types of bus structures including a memory bus or memory controller, a peripheral bus, and a local bus using any of a variety of bus architectures. System memory 1207 includes read only memory (ROM) 1252 and random access memory (RAM) 1254. A basic input/output system (BIOS) 1256, containing the basic routines that help to transfer information between elements within personal computer system 1201, such as during start-up, is stored in the ROM 1252. System 1201 further includes various drives and associated computer-readable media. A hard disk drive 1209 reads from and writes to a (typically fixed) magnetic hard disk 1211. An additional (possible optional) magnetic disk drive 1213 reads from and writes to a removable “floppy” or other magnetic disk 1215. An optical disk drive 1217 reads from and, in some configurations, writes to a removable optical disk 1219 such as a CD ROM or other optical media. Hard disk drive 1209 and optical disk drive 1217 are connected to system bus 1207 by a hard disk drive interface 1221 and an optical drive interface 1225, respectively. The drives and their associated computer-readable media provide nonvolatile storage of computer-readable instructions, data structures, program modules, game programs and other data for personal computer system 1201. In other configurations, other types of computer-readable media that can store data that is accessible by a computer (e.g., magnetic cassettes, flash memory cards, digital video disks, Bernoulli cartridges, random access memories (RAMs), read only memories (ROMs) and the like) may also be used. A number of program modules including emulator 1303 may be stored on the hard disk 1211, removable magnetic disk 1215, optical disk 1219 and/or the ROM 1252 and/or the RAM 1254 of system memory 1205. Such program modules may include an operating system providing graphics and sound APIs, one or more application programs, other program modules, program data and game data. A user may enter commands and information into personal computer system 1201 through input devices such as a keyboard 1227, pointing device 1229, microphones, joysticks, game controllers, satellite dishes, scanners, or the like. These and other input devices can be connected to processing unit 1203 through a serial port interface 1231 that is coupled to system bus 1207, but may be connected r by other interfaces, such as a parallel port, game port Fire wire bus or a universal serial bus (USB). A monitor 1233 or other type of display device is also connected to system bus 1207 via an interface, such as a video adapter 1235. In one example, video adapter 1235 may include a 3D graphics pipeline chip set providing fast 3D graphics rendering in response to 3D graphics commands issued based on a standard 3D graphics application programmer interface such as Microsoft's DirectX 7.0 or other version. A set of stereo loudspeakers 1237 is also connected to system bus 1207 via a sound generating interface such as a conventional “sound card” providing hardware and embedded software support for generating high quality stereophonic sound based on sound commands provided by bus 1207. These hardware capabilities allow system 1201 to provide sufficient graphics and sound speed performance to play software stored in storage medium 62. All documents referenced above are hereby incorporated by reference. wherein said texture coordinate processor interleaves the processing of direct and indirect texture coordinates. 2. The pipeline of claim 1 wherein an output of the shader can be recirculated to provide n blending stages. 3. The pipeline of claim 1 wherein recirculation of said shader output allows shade tree type combining operations. 4. The pipeline of claim 1 wherein the pipeline includes a recirculating texture unit coupled to the shader, and wherein said shader blends a texture output previously provided by the recirculating texture unit while the recirculating texture unit performs a further texture mapping operation to provide a further texture output for blending by the shader. 5. The pipeline of claim 1 wherein the shader includes a programmable clamper. 6. The pipeline of claim 1 wherein the shader includes a programmable scaler. 7. The pipeline of claim 1 wherein the shader includes a comparator. 8. The pipeline of claim 1 wherein the shader includes a programmable color swap. 9. The pipeline of claim 1 wherein an output of the shader is made available as an input for a plurality of subsequent blending operations. 10. The pipeline of claim 1 wherein the shader includes separate blending circuits for performing both color blend and alpha blend operations during a same blending operation stage. 11. The pipeline of claim 1 wherein the shader includes a feedback mechanism for providing an output to an input of said shader. 12. The pipeline of claim 11 wherein said feedback mechanism includes one or more storage buffers for retaining an output from a blending operation and at least one of said buffers has an output connected to an input of said shader. 14. The method of claim 13 wherein said steps (b) and (c) are repeated plural times. 15. The method of claim 13 wherein the component combining arrangement includes a texture color combiner and an alpha combiner. wherein said generating step (a) interleaves the processing of direct and indirect texture coordinates. 17. The method of claim 16 wherein step (b) is performed during a blending stage, and step (e) is performed during a further blending stage that is later than the first-mentioned blending stage. 18. The method of claim 16 wherein the combiner hardware provides more than ten successive stages of texture mapping data blending. 19. In a graphics rendering pipeline including at least one texture coordinate address unit and a texture environment unit including combiner circuits, an improvement comprising iteratively reusing the combiner circuits to provide multiple stages that apply multiple textures to a surface displayed within an image, wherein said multiple stages each provide both color blend and alpha blend operations, wherein said texture coordinate address unit interleaves the processing of direct and indirect texture coordinates. 20. The method of claim 19 wherein the iteratively reusing step includes using the combiner circuits to combine first texel colors during a first blending cycle/stage, and using the same combiner circuits to combine second texel colors using a second blending cycle/stage different from the first cycle/stage, the first and second cycles/stages both falling within a period for generating a single image frame. 21. The method of claim 19 where the first and second cycles/stages are consecutive. 22. The method of claim 19 wherein the combiner circuits include independent color combiner circuits and alpha combiner circuits. where A, B, C and D are selected from four current-color registers, rasterized color, texture, alpha components, 0 and 1. 25. A multitexture processing subsystem as in claim 24 wherein the blending unit comprises at least one multiplier and one adder and is configured to accept up to four input arguments for performing blending operations. 27. A multitexture processing subsystem as in claim 26 wherein the blending unit is connected to at least one storage register for making an output of a current processing stage available as an input to a subsequent temporal processing stage. 28. A multitexture processing subsystem as in claim 26 wherein the texture environment unit accommodates up to sixteen successive temporal processing stages. 29. A multitexture processing subsystem as in claim 26 wherein the feedback mechanism comprises a plurality of storage registers. 30. A multitexture processing subsystem as in claim 26 wherein the blending unit comprises at least one multiplier and one adder and is configured to accept up to four input arguments for performing blending operations. 32. A multitexture processing subsystem as in claim 31 wherein the input texture and rasterized color data comprises RGB and Alpha data. 33. A multitexture processing subsystem as in claim 31 wherein an output of a texture environment unit temporal processing cycle/stage is available as an input to a subsequent texture environment temporal processing stage. 34. A multitexture processing subsystem as in claim 31 wherein the texture environment unit may accommodate up to sixteen successive temporal processing stages. 35. A multitexture processing subsystem as in claim 31 wherein the texture environment unit further comprises a blending unit having at least one multiplier and one adder. 36. A multitexture processing subsystem as in claim 31 wherein the blending unit is configured to accept up to four input arguments for performing blending operations. wherein said texture coordinate processing step (a) interleaves the processing of direct and indirect texture coordinates. 38. A method for processing multiple textures as in claim 37 wherein an output from up to sixteen successive texture environment temporal processing stages may be provided as an input to a subsequent texture environment unit temporal processing cycle/stage. 39. A method for processing multiple textures as in claim 37 wherein input texture and rasterized color data comprise RGB and Alpha data. 40. A multitexture processing subsystem as in claim 26 wherein an output of a current processing stage is made available as an input to a plurality of subsequent processing stages. a hardware shader for performing shading/blending operations that receives a first texture data sample and a subsequent texture data sample from said texture unit and recirculates an output from a shading/blending operation performed using the first texture data sample to an input of said shader for performing a shading/blending operation using the subsequent texture data sample and the output from the shading/blending operation performed on the first texture data sample, said shader shading/blending providing both color blend and alpha blend operations, wherein said texture coordinate processor interleaves the processing of direct and indirect texture coordinates. 42. A graphics pipeline including a multitexture processing subsystem that sequentially provides samples of multiple textures to a hardware shader that performs blending/shading operations on texture sample outputs of the multitexture processing subsystem, wherein the system includes a texture coordinate processor and wherein said hardware shader recirculates a resulting output of a blending/shading operation for performing a subsequent blending/shading operation of said resulting output with a subsequent texture sample output, wherein said shader blending/shading operations provide both color blend and alpha blend operations, said texture coordinate processor interleaving the processing of direct and indirect texture coordinates. wherein the texture address coordinate/data precessing unit interleaves the processing of direct and indirect texture coordinates. wherein said single texture address coordinate/data processing unit interleaves the processing of logical direct and indirect texture coordinate data. a recirculating hardware shader connected to receive an output of the texture retrieval unit, wherein the shader blends selected received outputs to provide a calculated color or opacity output that is selectively fed back for use as an input to the shader for a subsequent blending operation, wherein said hardware shader provides both color blend and alpha blend operations, and wherein the texture address coordinate/data processing unit interleaves the processing of direct and indirect texture coordinates. a recirculating hardware shader connected to receive an output of the texture retrieval unit, wherein the shader blends selected received outputs to provide a calculated color or opacity output that is selectively fed back for use as an input to the shader for a subsequent blending operation, wherein said single texture address coordinate/data processing unit interleaves the processing of logical direct and indirect texture coordinate data. ATI Radeon 64 Meg DDR OEM, Aug. 19, 2000, www.hexus.net. Chris Johnston, "PlayStation Part Deux", Press Start, (C)1999. David Prescovitz, "Dream On", Wired, Aug. 1999. Gustavo Oliveira, "Refractive Texture Mappig, Part One", www.gamasutra.com, Nov. 10, 2000. Inside Sony's Next Generation Playstation, (C)1999. Jim Bushnell et al. "Advanced Multitexture Effects With Direct3D and OpenGL", Pyramid Peak Design & ATI Research, Inc., GameDevelopers Conference, (C)1999. John Schlag, Fast Embossing Effects on Raster Image Data, Graphics Gems IV, Edited by Paul S. Heckbert, Computer Science Department, Carnegie Mellon University, Academic Press, Inc., 1994, pp. 433-437. Steven Levy, "Here Comes PlayStation II", Newsweek, Mar. 6, 1999. Technical Presentation: DirectX 7 and Texture Management, Nov. 12, 1999, www.nvidia.com. Technical Presentation: GeForce 256 256 and RIVA TNT Combiners, Dec. 8, 1999, www.nvidia.com. Technical Presentation: Hardware Transform and Lighting, www.nvidia.com, posted Jun. 12 2000. Technical Presentation: Per-Pixel Lighting (by S. Dietrich) Mar. 14, 2000 www.nvidia.com. Technical Presentation: Phong Shading and Lightmaps, Nov. 3, 1999, www.nvidia.com. Technical Presentation: Vertex Cache Optimization, Nov. 12, 1999, www.nvidia.com. Technical Presentation; How to Bump Map a Skinned Polygonal Model, Jun. 7, 2000, www.nvidia.com. Technical Presentation; TexGen & The Texture Matrix, Mar. 15, 2000 www.nvidia.com. Whitepaper: 3D Graphics Demystified, Nov. 11, 1999 www.nvidia.com. Whitepaper: Guard Band Clipping, posted Jan. 31, 2000, www.nvidia.com. Whitepaper: Mapping Texels to Pixels in D3D, posted Apr. 5, 2000, www.nvidia.com.